Another two-parter from a rather lackluster rummage sale. But hey, you gotta kiss a few frogs, right? First of all, excuse the fact that some of these photos are pretty bad; these shots are taken in stolen moments when my daughter is eating lunch or playing in the other room, so I take what I can get! 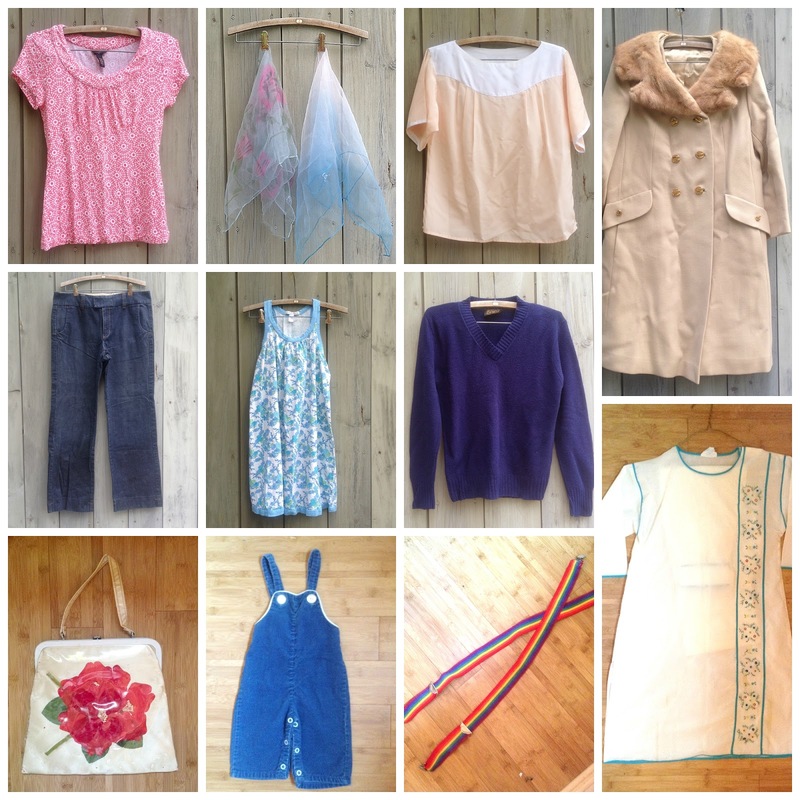 These first few items are from Day 1 of the sale; the ones on hangers are from the bag sale. Total impulse buy. I know very little about this style of garment and am not even 100 percent sure it's vintage at this point. Good or bad buy: Bad buy — I should have tried to do a bit of research before I bought it. Iconic! I was going to say "Who doesn't love a pair of rainbow suspenders" but then I realized, well, lots of people probably wouldn't be caught dead in them. But if you are just the right brand of quirky, these are totally your jam, am I right? These is probably a name for this style of handbag, where there is an applied decoration beneath a transparent layer of plastic. But since I know NOTHING about bags, I have no idea what it is. Anyone? Good or bad buy: Good buy if I can learn a little more about it. Good or bad buy: Good buy — they are pretty cute! I think I got this in under the wire before they stopped taking spring/summer stuff at the consignment store, whew. I should know soon if it has sold, since they are gearing up for their annual sell-off of seasonal merchandise. Not sure why I find this so charming, but I do. Do you ever find that your taste changes completely in different seasons? I'm clearly in full-on Summer Mode right now. Good or bad buy: ?? I can't really judge. Probably a good buy but I bet it will sell cheaply. More stuff I know nothing about, i.e. scarves of any kind. But they're pretty! In my universe, you can never have too many pullover sweaters (or as I call them, "weekend sweaters" because I basically never wear them to work). I seriously have scarcity anxiety about pullover sweaters, so I plan on hoarding this. Good or bad buy: Good buy ... I guess? You guys, I honestly do not know why I bought this. I think it was because I liked the contrast of the solid trim next to the print. THAT WAS NOT A GOOD REASON. I never wear nightgowns and there is virtually no chance I will sell this. So I think it's going into the rag bag and I may someday try to turn it into a dress for my daughter? Good or bad buy: Bad buy! I had no plan. Your basic straight-leg jeans, in impossibly heavy denim. If the consignment store gets mad about the crease in the right leg, I'm going to be annoyed. This is either the gem of this haul, or a new albatross around my neck, because no matter how desirable I think fur-collared coats are, I always have trouble selling them (prob. because shipping costs are so high). So, we'll see. Good or bad buy: Good buy, still, for the price. I was thrifting this weekend and the whole time I was thinking about how you grade your thrift hauls and, while I'm not buying anything to sell, I have started to come up with my own criteria. I mostly ask myself: a) Do I have at least three things in my closet I can wear this with? b) does it fit (and, if not, would my mom or sisters wear it)? c) Is it black or gray/does it fit in with the general theme of my wardrobe? All that is to say, you have inspired me to be a more conscious thrifter! Glad to hear I'm having a positive impact! :) It's always good to have criteria but I would suggest adding one more: d) Does this bring me joy? It's important to leave a little room in your life for things that don't "fit the mold," but that make you happy! That is a great criteria to add!